VertaseFLI was involved for several years prior to works commencing, being an integral member of the design consortium established to obtain planning permission for one of the largest open cast sites in Europe. Reclamation was required to three former local authority landfills, which were constructed over significant coal reserves. Our brief was to establish and mitigate risks to controlled waters and human health, excavation, treatment, re-instatement and export of non-treatable wastes. Intensive site investigations were undertaken to fully delineate the landfill in order to ascertain cost certainty and agree programmes with the client. Various trials established the most appropriate remediation methodology and the most appropriate design for the cement stabilisation. Extensive negotiations were undertaken with the Environment Agency, local contaminated land officer, HMR&C, ecologists and other interested parties. Earthworks were completed in extremely challenging conditions as the site was located at the summit of a welsh mountain. 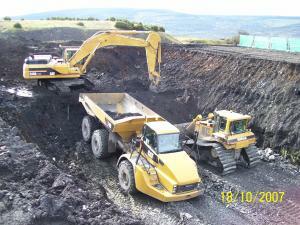 Excavation and physical processing of 380,000m3 of landfill wastes and soils. Bioremediation and composting of over 40,000m3. Cement stabilisation of over 50,000m3 of heavy metal contaminated soils. Segregation of 3,000m3 of asbestos. 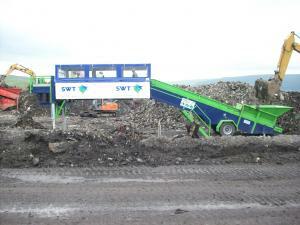 Offsite disposal of 19,000m3 of non-treatable wastes. Reinstatement of over 290,000m3 of recovered soils and aggregate. Collection, treatment and disposal of 100’s of m3 of landfill leachate. Works required significant environmental management and liaison with interested parties. Recovered soils and materials were reused by the client.